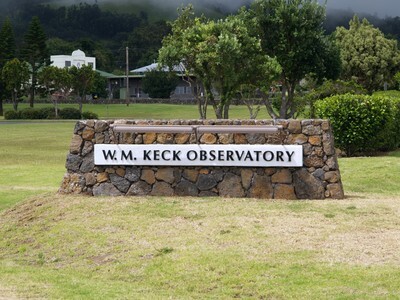 The twin 10-meter Keck Telescopes are located on Mauna Kea at an elevation of 13,600 feet. Headquarters for the observatory is located in Waimea, 19 miles to the NW and at a much more manageable elevation of 2,700 feet. The HQ was disappointing to visit because all the visitor gets to see is the lobby, which has a couple models and a couple photos. Exposure data was lost by Kodak EasyShare. My E-1 was brand new and I didn't have enough memory cards for our trip to Hawaii, so I had to transfer my images to CD a couple times. Unfortunately, the only method I could find in Hawaii was to use a Kodak EasyShare machine. EasyShare has several problems:  while it maintains image dimensions, it increases the JPEG compression;  it strips off the filename provided by the camera and substitutes its own;  it strips off ALL of the EXIF information; and,  the EasyShare program is aggressive and wants to force itself onto your computer. I sent Kodak a nasty letter about EasyShare but received no reply, let alone an apology. This was my one and only use of EasyShare.